The São Paulo Carnival it's not just about Schools of Samba at Anhembi. There are many other events happening during the biggest Brazilian Party. One of the most popular manifestation is one called Blocos de Rua (Street Parade Block - sort of bunch of people following pre-organized route around the city). According to the ABASP - Associação das Bandas Carnavalescas de São Paulo (Sao Paulo Association of Carnival Bands), eight blocks have already confirmed the date and route of the parade. Check below which blocks already agreed the date of the parade, where is the meeting point and the route they must follow. The Street Parade will happen on Wednesday (February 10th) through the streets of the neighborhoods of Bela Vista and Bixiga, in the Centre of Sao Paulo. The concentration (meeting point) will be at 5pm on the corner of Rua Santo Antonio and Rua 13 de Maio, in Bixiga. The parade should start around 9pm. Route (click here to see on the map): Rua Santo Antônio, Rua Martinho Prado, Rua Martins Fontes, Rua da Consolação, Rua Cel. Xavier de Toledo, Praça Ramos de Azevedo, Teatro Municipal, Rua Conselheiro Crispiniano, Largo do Paissandu, Av. São João, Av. Ipiranga, Praça da República, Av. São Luiz, Viaduto 9 de Julho and Rua Santo Antônio until the corner of the Rua 13 de Maio. 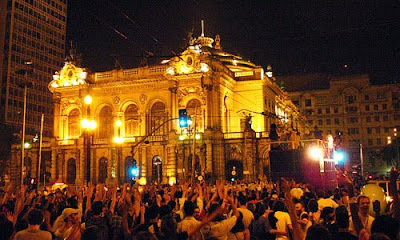 The Street Parade will happen on Monday (February 8th) at 9pm on the streets of the Central region of Sao Paulo. The meeting will be at 7pm on the corner of Rua da Consolação and Avenida Ipiranga. Route (click here to see on the map): Rua Dr. Teodoro Baíma, Rua da Consolação, Rua Cel. Xavier de Toledo, Praça Ramos de Azevedo, Teatro Municipal, Rua Conselheiro Crispiniano, Largo do Paissandu, Av. São João, Av. Ipiranga, Praça da República and Rua Dr. Teodoro Baíma. The parade will be in Barra Funda, in the central region of Sao Paulo, Saturday, (February 6th), at 3pm. The concentration is scheduled for midday at Rua Souza Lima, 295. Route (click here to see on the map): Rua Souza Lima, Rua Barra Funda, Alameda Eduardo Prado, Praça Marechal Deodoro, Rua General Olimpio da Silveira, Rua Mario de Andrade, Rua Lopes Chaves, Rua Joao de Barros, Rua Brigadeiro Galvão, Rua Conselheiro Brotero, Rua Barra Funda and Rua Souza Lima. The Street parade goes through the streets of Cambuci between the central and south zone of Sao Paulo. The parade is scheduled for 4h30pm, but the concentration will be at 2pm, in Largo do Cambuci. Route (click here to see on the map): Largo do Cambuci, Rua Luiz Gama, Rua Cesário Ramalho, Rua dos Alpes, Rua Gerônimo de Albuquerque, Rua Barão de Jaguará, Rua Silveira da Motta, Rua Justo Azambuja and Rua do Lavapés until the Largo do Cambuci. The Street Parade will happen on the neighborhood of Consolação, Central region of Sao Paulo. It's scheduled to on Friday (February 12th) at 9pm. The concentration will be at 7pm at Rua Augusta with Rua Luiz Coelho, close to the Consolação Metro Station. Route (click here to see on the map): Rua Augusta, Rua Martins Fontes, Rua Cel. Xavier de Toledo and Praça Ramos de Azevedo. The show runs through the streets of some neighborhoods in the Bela Vista and Bixiga, in central Sao Paulo. In 2010, the parade will start at 7pm on Thursday (February 11th). The concentration will be at 5pm, at Rua Rui Barbosa, 323. Route (click here to see on the map): Rua Rui Barbosa, Rua Santo Antônio, Rua 13 de Maio, Viaduto Armandinho do Bixiga and Rua Rui Barbosa. The block is scheduled to the Butantã neighborhood, West Zone of São Paulo, on Friday (February 5th), at 9pm. The meeting point, however, begins much earlier, at 4pm, at the corner of Avenida Waldemar Ferreira and Rua Judge Armando Fairbanks. Route (click here to see on the map): Rua Desembargador Armando Fairbanks, Av. Vital Brasil, Rua Estevão Lopes, Rua Gaspar Moreira, Praça Monte Castelo, Rua Romão Gomes and Av. Lopes, Rua Gaspar Moreira, Praça Monte Castelo, Rua Romão Gomes and backs to the Av. Waldemar Ferreira. The block does two times the same route. The Street Parade will happen on Sunday (February 7th), at 4pm the streets of Tremembé in the north region of Sao Paulo. The meeting will be at 1pm at Rua Dr. Saturnino Vilalba around the Praça Lions. Route (click here to see on the map): Rua Dr. Saturnino Villalva, Rua Mártires Armênios, Rua Reverendo George Michel Atlas, Rua Alcindo Bueno de Assis and Rua Lavinia Pacheco e Silva.